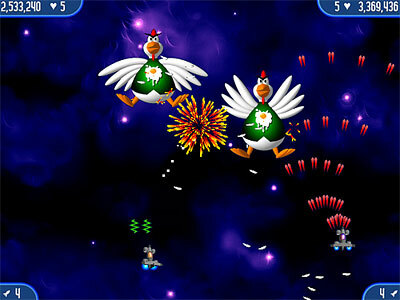 In the first chapter of the Chicken Invaders saga, you defended earth against an invasion of intergalactic chickens seeking revenge for the oppression of their earthly brethren. 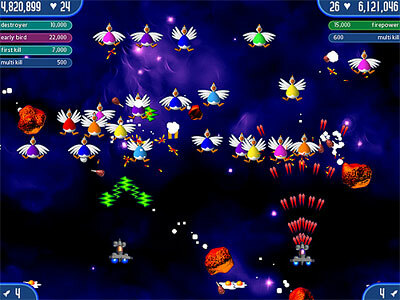 However, as you were clearing out the last of the chicken invaders and were looking forward to a double chicken burger special at the space burger bar, the true scale of the problem became apparent: the first invasion was simply a precursor to the chicken's main assault! 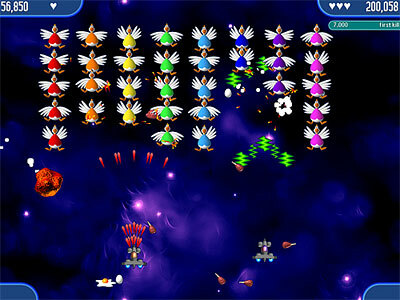 Their master plan now becomes clear: to invade each planet in the solar system and make sure that it is inhabited exclusively by chickens!The time has now come to don your teflon-coated, egg-repulsing helmet and make the biggest omelette you've ever made as you continue your adventure in the second chapter of Chicken Invaders: The Next Wave. Only you can make a difference. Will you succeed? Will the future of chicken burgers be secure? Or will you end up as part of the menu in a galactic chicken restaurant?